Purchasing a Reciprocating Air Compressor | Compressor-Pump & Service, Inc.
1. WHAT ARE YOU USING THE COMPRESSED AIR FOR? Start/Stop Control is used for applications where air is not required continually, allowing the compressor sufficient cooling time. When system pressure falls below the set start-up pressure, the compressor will automatically start. When the cut-out pressure is reached, the compressor will automatically shut-off and will not start again until the system pressure falls below the minimum start pressure. If air demand is continuous and the compressor doesn’t shut down within its recommended duty cycle Constant Speed Control should be used. Constant Speed Control keeps the compressor from excessively starting and stopping. As with start/stop control, it has a minimum start pressure and a maximum cut-off pressure. This feature prevents premature motor failure and minimizes operating costs associated with high amp-draw. As a general rule, if the compressor starts more than six to eight times per hour, you should operate with constant speed control. If the compressor starts less than six times per hour, start/stop control is recommended. Dual Control allows the compressor to operate in either start/stop mode or constant speed control mode. This control method allows the user to easily adjust the control mode dependent upon compressed air usage. 2. WHERE WILL THE COMPRESSOR BE LOCATED? Compressors that will be placed outdoors will require protection from the elements and typically NEMA-4 rated electrics. When an air compressor is place indoors adequate ventilation is critical for long term reliability and operation. Reciprocating compressors specifically are air-cooled and must have proper air flow to prevent damage from overheating. Reciprocating compressors should be placed at least three feet from the wall to ensure proper air flow and not in an enclosed space such as a closet. 3. HOW MUCH PRESSURE (PSI) DO YOU REQUIRE? The PSI, or pounds per square inch, rating of a compressor must match or exceed the PSI requirement of your most demanding process (air tools, equipment, etc.). Keep in mind that depending on the size and length of your air piping and also the installation of any air treatment equipment such as dryers and filters pressure drop will occur which must be factored into your total air demand. Make sure you review the manufacturer’s specifications and pressure requirements for all of your equipment. The decision between a single-stage or two-stage compressor is driven by pressure as well. Single-stage reciprocating compressors typically have a maximum PSI of 135 while two stage compressors are typically rated for 175PSI. 1. CFM, or cubic feet per minute is a measure of air flow the compressor can create. CFM is stated in two different forms, piston displacement (PD) or actual cubic feet per minute (ACFM). Always consider the ACFM as it reflects the amount of useable air available for work. When purchasing an air compressor it is important to review how the manufacturer states performance (CFM) as the difference can be significant. 1. Horsepower is directly proportional to the CFM rating of a compressor; typically, the higher the horsepower the more air (CFM) the compressor can produce. It is important not to rely solely on horsepower or attempt to buy the highest horsepower compressor you can afford but rather let your CFM and PSI requirements determine the horsepower you will require. 6. WHAT SIZE AND TYPE OF AIR TANK DO YOU REQUIRE? 1. 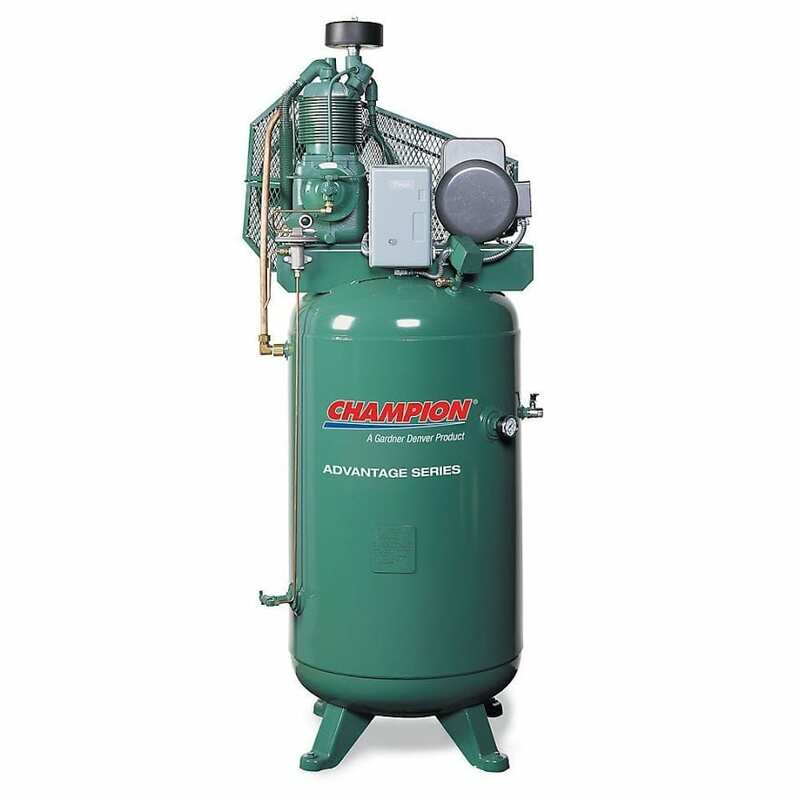 The air compressor’s receiver tank helps eliminate air pulsation and provides storage when the demand for air exceeds the capacity of the compressor for short periods of time allowing the compressor to catch up. The larger the tank, the more pressurized air is available for output. The smaller the tank, the more the compressor has to work to keep up with the demand. Your available floor space and personal preference will determine whether you should look for a vertical or horizontal tank. Vertical compressors have a smaller footprint than a horizontal design thus freeing up more of your valuable workspace. 7. WHAT COMPRESSOR FEATURES SHOULD YOU CONSIDER? 100% cast-iron construction – ensure that ALL critical components are cast-iron. Some manufacturers will state 100% cast-iron construction yet only utilize cast-iron cylinders. Splash lubrication provides simple, reliable design reducing initial purchase price while pressure lubrication will provide forced lubrication to critical wear areas offering the best reliability and performance. Heavy duty stainless-steel valves eliminate corrosion and also ensure long service life. Two-piece connecting rods allow for easy maintenance with minimal tear down of the pump. Oil-monitoring devices prevent damage caused from running your compressor with inadequate oil. Other features such as an air-cooled aftercooler, auto tank drains, and vibration pad help to not only improve air quality but can also ensure years of trouble free operation. 8. WHAT ARE THE ELECTRICAL REQUIREMENTS OF THE INSTALLATION?